Return of Red Bull Music’s ‘Drone Activity’ featuring 12 Chicago Experimental Artists, and ‘Last Night A DJ Saved My Soul’ headlined by Farley Jackmaster Funk and DJ Pierre. 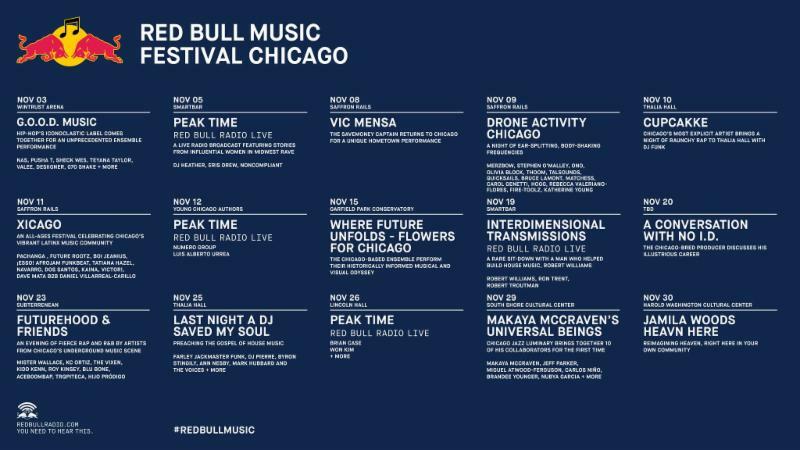 Red Bull Music will launch the latest installment of their critically acclaimed international music series in Chicago this November, bringing with it a month-long slate of expertly curated original programming spanning the city’s diverse music genres. Red Bull Music Festival Chicago will explore and celebrate Chicago’s rich cultural heritage while spotlighting its modern music landscape. Red Bull Music Festival (RBMF) makes its midwest debut after six acclaimed installments in New York City and a 2017 Los Angeles festival, and will feature live performances, club nights and lectures at some of Chicago’s most unique venues. The festival also marks Red Bull Music’s return to the Windy City after 2017’s 30 Days in Chicago. Chicago is the home to some of hip hop’s most cutting edge artists and the event series will celebrate many of them, kicking the festival off with one of the largest RBMF events to-date. Taking place at Wintrust Arena, artists from hip-hop’s iconoclastic label G.O.O.D. Music will come together for an unprecedented ensemble performance featuring Nas, Pusha T, Teyana Taylor, Sheck Wes, Valee, Desiigner, 070 Shake and more. SaveMoney Captain Vic Mensa will bring his fans in Chicago a unique hometown performance and CupcakKe–Chicago’s most explicit emerging star–brings a night of raunchy rap to Thalia Hall. Rapper Mister Wallace and rapper/DJ/producer Anthony “aCeb00mbaP” Pabey‘s burgeoning Chicago-based, LGBTQ-centric record label Futurehood will present an evening of fierce rap and R&B by artists from Chicago’s underground music scene including Roy Kinsey. The festival will also host in-depth conversations with legends and rising stars. Producer and record label exec No I.D. will discuss his Chicago roots and his illustrious career, including producing Jay-Z’s 4:44. Vivian Host will also bring a special live version of her Red Bull Radio Show Peak Time to the live stage three times over the month. The first installment is a live radio broadcast featuring the leading women of the midwestern rave scene–DJ Heather, Noncompliant and Eris Drew. The second will feature two conversations at Young Chicago Authors–first with Numero Group co-founder Rob Sevier and then with Pulitzer Prize-nominated writer Luis Alberto Urrea about his work and the music that’s soundtracked his extraordinary life. The final Peak Time Live with feature a conversation with some of Chicago’s most dynamic restaurateurs and chefs examining the overlap between Chicago’s music and culinary scenes. Red Bull Radio will also host a live version of the bi-weekly radio show Interdimensional Transmissions, featuring a rare sit-down with Robert Williams, the man who was foundational in the origin story of House music. True to the city’s culture of civic activism, the festival’s line up prominently features artists whose music aims to make an impact. In addition to Mensa, who founded the SaveMoneySaveLife foundation to foster civic action through arts and entertainment, musician and Associate Artistic Director of the non-profit youth organization Young Chicago Authors Jamila Woods will bring the soulful, genre-blending songs of love and protest from her solo debut HEAVN to the stage for a final performance of the album. Accompanied by strings, a choir, a DJ, poets, dancers, and visual artists, Woods aims to encompass the broad spectrum of incredible art emanating from Chicago, proving that no matter the obstacles, you can create heaven in your community. Black Monument Ensemble–a group formed to address today‘s pressing civil rights issues through art, led by multi-dimensional Chicago artist Damon Locks–will perform their 80-minute musical and visual odyssey Where Future Unfolds – Flowers For Chicago at Garfield Park Conservatory. For one night only at Garfield Park Conservatory, the Black Monument Ensemble will perform their singular, multi-sensory show, Where Future Unfolds – Flowers For Chicago. An 80-minute musical and visual odyssey that investigates the circularity of history, the show is inspired by the church-rooted black activism of the ’60s/’70s. The brainchild of visionary Chicago-based artist, educator, vocalist/musician, and DJ Damon Locks, the Black Monument Ensemble formed to address today‘s pressing civil rights issues through art. In addition to singing, the Black Monument Ensemble utilizes samples and drum machines alongside their vocals and percussion. Throughout the show the Ensemble will project Locks’ riveting visuals in concert with the music. In our politically fraught times, Where Future Unfolds offers an escape from the present and begins the work for the hurdles ahead. Tickets On Sale Tuesday, September 25th @ 10 AM CT.